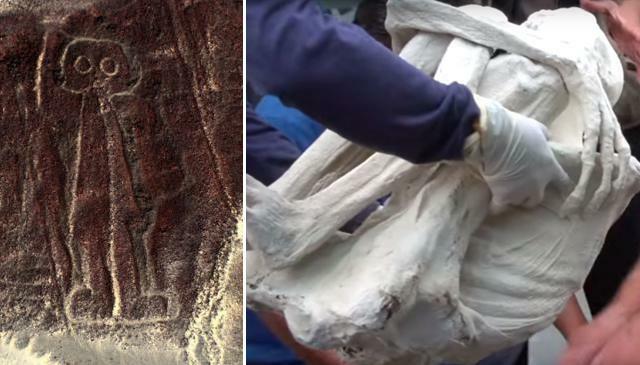 Home » New Alien Mummy Discovered In Peru Near Nazca Lines? A new anomalous discovery has been unearthed in Peru. Filmmakers of gaia.com Joined scientists and researchers outside of Nazca, Peru to investigate the discovery of an unearthed mummified body. Universities and independent scientists are currently analyzing findings and probing material that is unlike anything found in Peru. Is this a primitive human with intentionally developed deformities or the undeniable evidence of extraterrestrials visiting Earth? We will report on the scientific analysis as the results come in.